By Sadiq Umar – The Chief of Army Staff, Tukur Buratai, has cautioned troops to be wary of Boko Haram terrorists and their sympathizers’ recent antics in the employment of propaganda particularly the spread of fake news. The warning is coming on the heels of recent media reports and video especially on social media in which the Boko Haram terrorists claimed victory in attacks against the military in Metele. 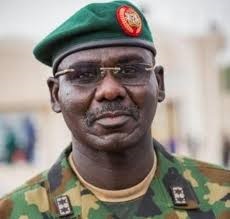 Mr. Buratai, a Lieutenant General, gave the charge at a dinner for the troops of Armed Forces Special Forces Battalion (AFSF Bn) and Army Headquarters Strike Group in Maiduguri on Saturday. The Army chief stressed that the troops should be mindful of what they see and read on the social media as most of the stories are either doctored or fake. Believing these stories, he added, would demoralize their fighting spirit, thus undermining national security. The COAS, in a statement by the Director, Army Public Relations Sani Kukasheka Usman, said the Armed Forces and other security agencies were now fighting terrorism as insurgency has long gone; Boko Haram terrorists he said, have no claim to any territory in Nigeria. He therefore implored them to put to good use the tactics acquired during their special forces training in order to flush out the remnants of the terrorists. He emphasised that, adequate attention will be given to In-theatre training and intelligence gathering and capabilities of personnel would be enhanced. In his vote of thanks on behalf of the officers and men of both units after the dinner, the Commanding Officer of the AFSF Bn, Navy Commander GB Osuobeni, thanked the Chief of Army Staff for the visit and the kind gesture of hosting them to a dinner. He said that the event signifies the Chief of Army Staff’s appreciation and support of their efforts in the fight against terrorism in the north east under the auspices of Operation LAFIYA DOLE. The Commanding Officer stated that the occasion would remain indelible in their minds and that the troops of both units were highly motivated by the visits, interaction and the dinner. He further thanked the Chief of Army Staff for the rare privilege and assured that they would continue to do their best to clear the remnants of the Boko Haram terrorists hiding in the border areas and other areas of the north eastern part of Nigeria. In her remarks, Miss Global Synergy Nigeria (Africa), Queen Stessey Nuhu, of the University of Maiduguri who graced the occasion, lauded the troops efforts in fighting terrorism. She commended them for their sacrifices in restoring peace to the North East and entire country. She also solicited support to launch her pet project with theme “Homeless not Hopeless”.